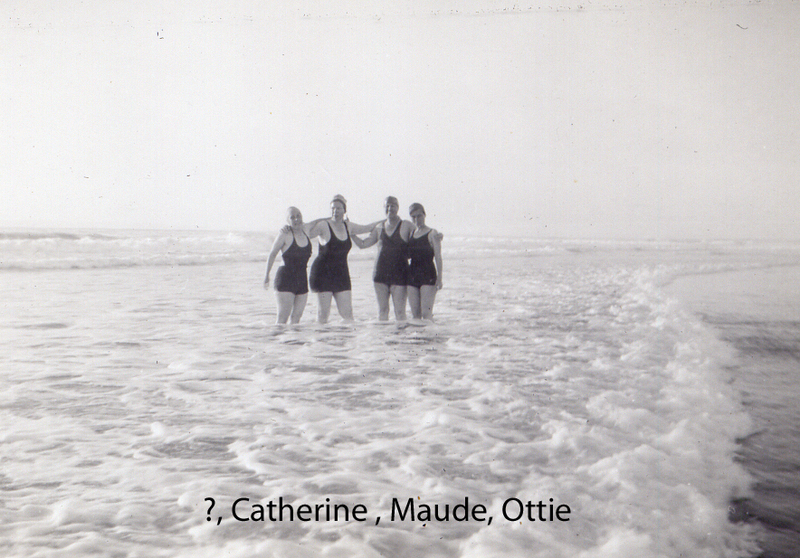 Carnival of Genealogy, 74th Edition is back by popular demand, the topic for the next edition of the Carnival of Genealogy will be: Swimsuit Edition! Why should Sports Illustrated have all the fun? This is your chance to show off the bathing beauties in your family…Let’s have some fun here! 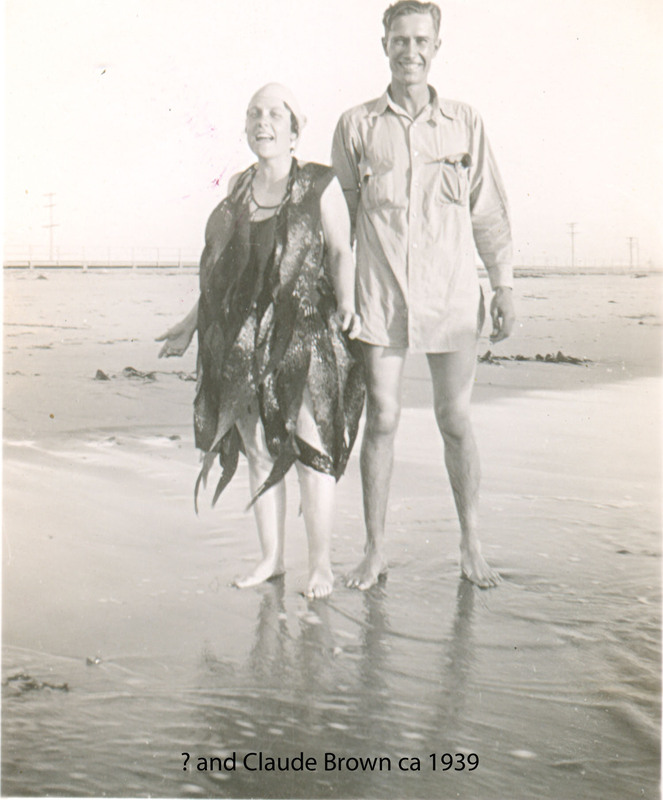 When I think of old family photos, swimsuits and fun I instantly think of a particular series of ‘seaweed photos’ of my paternal Grandmother. Seaweed has many natural health benefits for us including skin softening and stress release. I doubt that my great grandmother, grandmother and their friends really thought about it that way the day they went to the beach and used the seaweed fronds to make coverups for their swimsuits and complete their beach costumes. 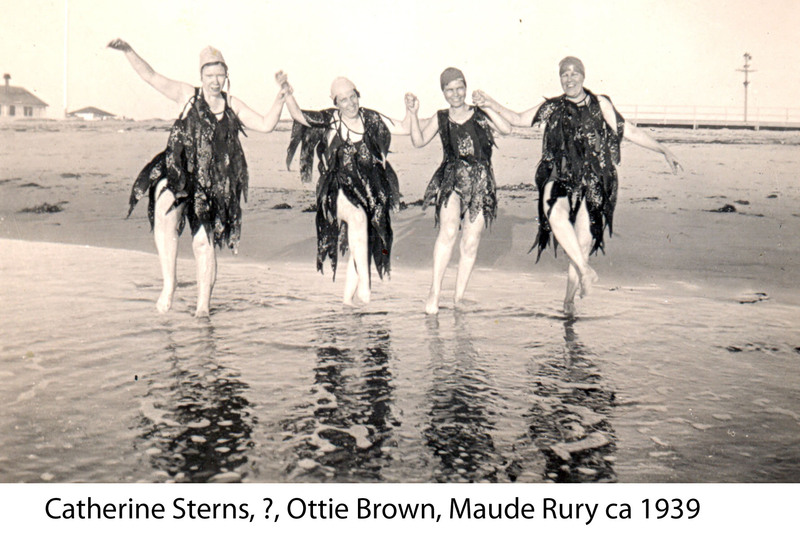 The photos I’m submitting for this 74th edition of COG clearly shows us the bathing suits of late 1930’s and one way to use the natural stress relieving qualities of seaweed by having fun, laughing and smiling. See for yourself the benefits of seaweed…did looking at it make you smile too? Mother was real handy to sew and she bought a Singer machine and it was a treadle machine when we moved to Guthrie in 1913. She could just take old clothes and turn them and wash them and she could make us girls lots of coats and dresses and things because she could sew so well. My grandmother Ottie was also good at making all kinds of things that involved sewing or crocheting. I do not know what skill sets the other two ladies brought to the group. However, they all brought their sense of fun that day. This must have been a team effort and they are obviously enjoying themselves trying to synchronize their leg kicks, pose all the while releasing any stress they may have had. In trying to narrow down when these photos were taken, below are other ‘seaweed photos’ that may have been taken at the same time and have other people in them. 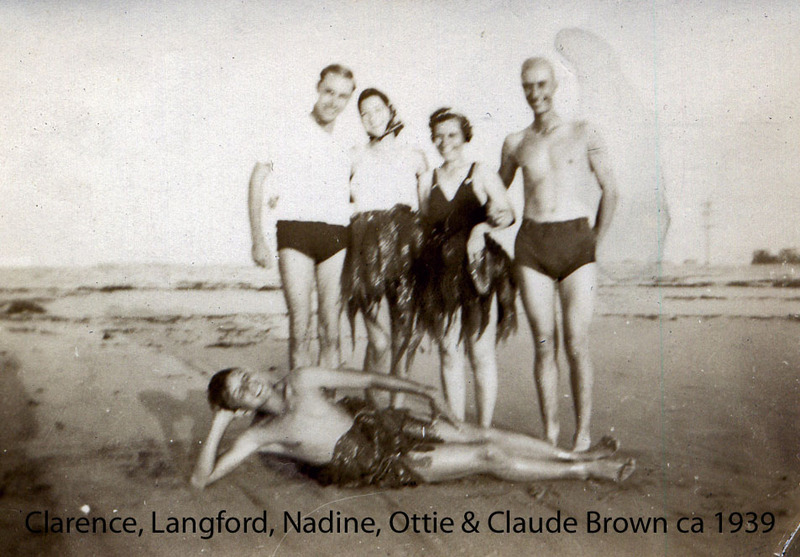 If the photo with Clarence was taken at the same time it was likely a different day because my grandmother seems to have a different swimsuit on, it has different straps. So, playing dressup with seaweed fronds may have been a tradition for beach fun undoubtably due to its natural stress relieving properties. Are you going to post the other pictures to Flickr? They are way too cute. Fun, fun, fun. Were they having fun or what? I didn’t know seaweed was so plentiful on the beaches. OMG I’m LOL! These are terrific photos! These ladies must have had quite a sense of humor. What a hoot! I love these pics. Thanks so much for sharing them in the Carnival of Genealogy! How fun! Thank you for sharing these unique treasures. I can imagine one set of my grand-aunts in particular enjoying just such a day. but they would NEVER have thought of seaweed dresses! Thank you for leaving comments I love feedback. I haven’t seen anything so funny in all my life! Thanks for sharing!!! It certainly looks like they had a terrific time! I’m glad to know that others enjoy these photos as much as I do. That is fascinating to think about! I certainly agree that they didn’t just throw the fronds over them, they spent time to make them look more like a costume. I wish we could know the story behind the photo but maybe they did have the Iolanthe in mind. Thank you for visiting and sharing your thoughts with me. I gasped at the first photo, but then quickly worked up a grin as I thought about how much fun they must’ve had with the seaweed. Sure is slimy stuff though. Love how you’ve woven the story with the images! The thought of the seaweed being slimy or smelly is easy to forget with just a photo. Thank you for leaving me a comment.